How a global internet phenomenon is foreshadowing the effects of virtual reality and changing the way strangers connect online. Sitting in a home office filled with stuffed animals, South Korean internet celebrity BJ MBRO alternates between taking bites of barbecue chicken and rice. He’s good humored, and he emphasizes his approval of the food by giving thumbs-up, widening his eyes, and speaking in an upbeat, rhythmic manner as if he were a parent trying to persuade a stubborn young picky eater to try the food. The camera is angled in such a way that it makes the viewer feel as though they are sitting at the table with him. For the next hour and twenty minutes, BJ MBRO eats five whole chickens and eight bowls of rice. With almost six million views, this is his most popular video on YouTube. To many, this video’s popularity may bring out feelings of curiosity, disgust, or even shock. But to millions of young South Koreans, watching these videos (known as mukbangs) is just another part of daily routine. Mukbangs—online video broadcasts in which the host consumes large quantities of food in one sitting—began appearing in the early 2010s, and they have become extremely popular. My research suggests that mukbang’s popularity is largely a result of viewers attempting to assuage their loneliness by making connections with mukbang creators in order to simulate the immersive experience of eating with friends or family. Although it originated in South Korea, mukbang has also spread to other countries. However, its popularity, and the forms it takes abroad, shows important contrasts with those in South Korea. Once a poor, overlooked agricultural-based country, in the last half-century, South Korea has transformed itself into an economic and technological powerhouse. The influence of technology is almost impossible to avoid, with 99 percent of households having internet access. With advanced technology and the internet being readily accessible, South Korea’s obsession with the online world is something of a Pandora’s box. In 2017, Koreans spent almost 16 hours a week on the internet, with 31 percent of smartphone users watching mobile videos on a daily basis in 2016. For years, South Korea has been combating internet addiction through rehabilitation camps. The country’s internet addiction is a side effect of deeply rooted detriments: many young South Koreans suffer from isolation, loneliness, and in turn, depression. Furthermore, much of this addiction is associated with parental depression. A study conducted by Yonsei University and Ilsan Hospital in Seoul found a correlation between maternal depression and internet addiction among adolescents. In South Korea, single parents had worse mental health than partnered parents. As the burden of parenting takes a toll on single mothers’ mental health, their children were more likely to develop an internet addiction. With one-person households projected to increase as marriages decrease, younger generations who already suffer from loneliness—and sometimes strained family life—have turned to mukbang to cope with these emotions by making virtual connections with others online. 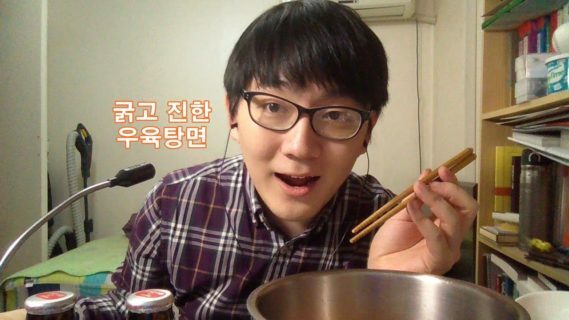 Although mukbang’s origins lie within South Korean digital communities, in both Korean and global digital spaces creators and viewers communicate directly, forming an immersive, augmented reality-like experience. For those who have never seen mukbang, watching it for the first time garners a variety of emotions from confusion to disgust to fascination. The mukbang format is simple: a person (usually young) sits in front of massive quantities of food (portions meant for large groups) and a microphone and camera. The creators livestream themselves eating and talking with viewers; their audiences watch and chime in by commenting and asking questions about any number of subjects, from the quality of the beef they were grilling to where they planned to spend New Year’s. This back and forth establishes a sense of friendship between the two parties and is part of what makes mukbang is so popular. However, it is not just the sight of food that is important to mukbang but also the sounds that come with eating and cooking. To some, chewing noises, preparing foods, and the sounds from opening up food packages are calming. These sounds are known as autonomous sensory meridian response: they cause static-like, tingling sensations along the skin, and in turn trigger a sense of euphoria and relaxation. These noises were especially emphasized in the mukbangs I watched, as creators would purposely open bags of foods close to mic so that their viewers felt as though they were sitting right next to them. While many of the mukbangs in South Korea focus on traditional Korean comfort foods and a substantial number of viewers watch it as a coping mechanism in response to loneliness, those made outside South Korea take on with different forms and emotional responses. Many English-speaking multinational creators tend to feast on fast foods from major corporations. The audiences of these videos tend to tune for the enjoyment and shock value that comes with watching others eating different types of foods, rather than the immersive aspect of vicariously dining with others in order to mitigate feelings of loneliness. And although multinational creators are not directly sponsored by global fast-food chains, their videos refract the content of advertisements. At the same time, these mukbang creators consume fast foods without their videos coming off as a “plug” for a company, instead they are just part of the act. Creators tell their audiences about trying limited edition food items. This peaks the interest of audiences who may be curious about certain foods, but who may not want to spend money on it. Since non-Korean mukbangs feature foods from corporations and chains, viewers are more exposed to advertising and thus creating a new form of connectivity between companies and consumers with mukbang creators unintentionally playing the role of the middleman. However, much like their Korean counterparts, English-speaking creators are very active with their viewers. Creators answer questions, tell stories, and talk about the food as if the viewers were close friends. Even though non-South Korean mukbangs attract audiences through subtle advertising, they are still sparking changes in communication that appear similar to South Korean mukbangs. The concept of watching others perform tasks on digital platforms is not isolated to mukbang. Some of the most popular YouTubers and YouTube videos show people playing video games, applying makeup, and unboxing packages. Such videos have gone viral on YouTube, in part because they show products that many viewers do not personally own, allowing the them to experience the product in a digital space. Some products featured in these videos are sponsored by companies, thus creating another dimension of advertising within the video. The level of audience engagement in mukbangs, however, goes beyond the vicariousness of other videos such as gaming or unboxing videos. Mukbang is a precursor to immersive technological connections that will be more prevalent in the future. 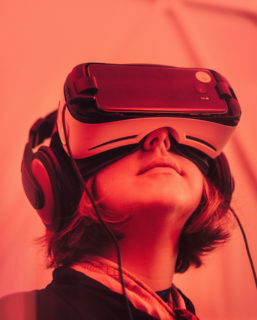 With the advent of virtual reality (VR), the way digital advertising conducts itself is changing: VR allows for stronger, more personal connections between the product and consumer. Although mukbang’s origins lie within South Korean digital communities, in both Korean and global digital spaces creators and viewers communicate directly, forming an immersive, augmented reality-like experience. The massive popularity of mukbang in South Korea grew out of a response to the environments and lifestyles of young South Koreans today. In just a few years, it has become a global phenomenon. When the English-speaking world adopts mukbang, its viewers are lured by the videos’ novelty and shock value. This will be an important phenomenon to watch unfold. As humans are becoming increasingly virtually connected, many of these connections translate into emotional ties. The popularity of mukbang and new ways of connectivity through VR-like experiences through digital media suggests a bridge between the vicarious platform-based sociality and person-to-person connections. Sofia Woo is a high school senior from San Francisco, California. She won Best in Category for Anthropology at the 2018 MIT INSPIRE competition, and she plans to double major in history and anthropology when she starts college.